Long predicted to be the car of the future, electric drive vehicles (EVs) are already here and quickly gaining acceptance. Hybrid electric vehicles, like the Toyota Prius, use a combination of an internal combustion engine and an electric motor powered by a battery. Additionally, low speed, plug-in electric vehicles (PEVs), like those often seen on university campuses, have been around for years. The two major types of high speed PEVs are battery electric vehicles (BEVs) and plug-in hybrid electric vehicles (PHEVs). BEVs are powered solely by a battery that is charged by plugging the vehicle into an electric power source. 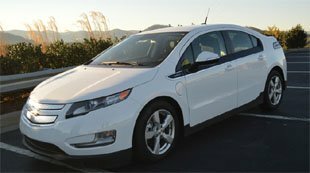 PHEVs, such as the Chevy Volt, can be powered by either a battery or a back-up gas engine that provides additional driving range. “All major auto manufacturers are going to be making these plug-in vehicles over the next two years,” says Bill. For now, the two best-known and most popular PEVs are the Nissan Leaf (a BEV) and Chevy Volt (a PHEV). 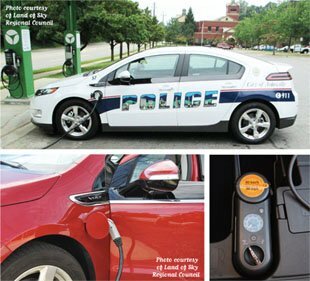 Over the past year, Brian Taylor, a regional planner at Land of Sky Regional Council, has been working with others to develop the Asheville Area Plug-in Electric Vehicle Plan that will help WNC prepare for electric vehicle adoption. He looks at the benefits of EVs, which include reduced air pollution and greenhouse gas emissions, energy independence, and economic development. Stan Cross, of BrightField Transportation Solutions, says he hopes people can “drive on sunshine” by using his solar-powered charging stations (there are four now in Asheville). This plan is being developed as part of the NC PEV Readiness Initiative: Plugging in from Mountains to Sea (M2S), a project funded by the U.S. Department of Energy to reduce barriers to electric vehicle adoption in North Carolina. The M2S project also supports the development of community PEV plans in three other regions of the state as well as the N.C. PEV Roadmap. One objection to EVs is the vehicle’s high initial cost, but the federal tax credit of $7,500, however, does help. The total cost of ownership for EVs can be quite low (drive 15,000 miles or more per year and you can save an estimated $1,500 annually on fuel). Since it runs only on battery power with no need for gasoline, the Nissan Leaf always has zero tailpipe emissions and a range of up to 70–100 miles on a single charge. 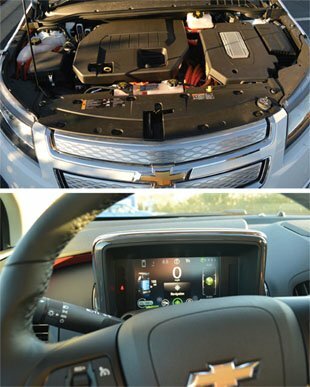 The Chevy Volt has a 120-V lithium-ion battery that allows it to travel about 35 miles in electric mode, but it also includes an auxiliary gas engine onboard for a total of 380 miles of driving range. “If the battery runs out of juice, the gas engine will kick in and run the generator, which will create more electricity,” explains Don Elliot, owner of Sunshine Chevrolet. Some Volt customers, like Hendersonville’s mayor, Barbara Volk, rarely use gasoline. She says she spends an average of $.50 per day in electric usage. Unlike users of the BEVs, PHEV drivers do not have “range anxiety,” or the fear that they might run out of electricity and be stranded. Plans, like those of M2S, are in the works to address this concern. Already, 43 charging stations currently exist in the Asheville area. Based on electric vehicle forecasts developed by the Electric Power Research Institute, there will be roughly 8,000 electric vehicles on the road in our region (Buncombe, Henderson, Madison, Transylvania, and Haywood counties) by 2020. The rise of electric vehicle purchases and the race to create the infrastructure to support them are running neck and neck. For more information visit the NC PEV Taskforce. Special thanks to Brian Taylor and Bill Eaker of Land of Sky Regional Council, David Williams of Eaton Corporation, Stan Cross of BrightField Transportation Solutions, and to Sunshine Chevrolet, 13699 Hendersonville Road in Fletcher.